1. 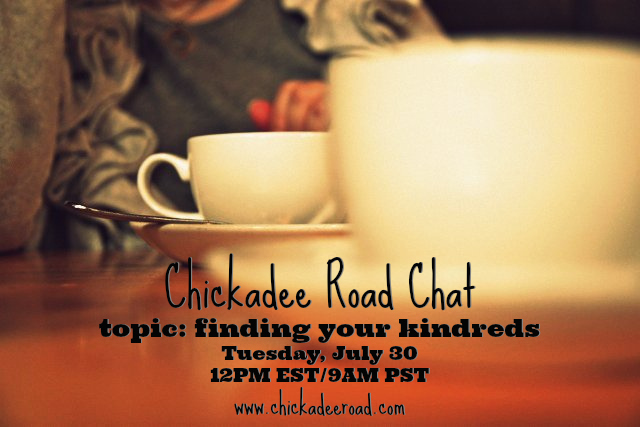 Another Chickadee Road Chat! Join Kelly and me for brunch/lunch on Tuesday, July 30 at 9AM PST/12PM EST for a chat all about finding your kindreds. (Actually I'm calling it "finding (and keeping) your kindreds" when I think about it because when you find those special people who feel like home, you will continually uncover new things about yourself that will push you to know you have to work a bit to stay connected in this crazy, awesome world. Yes.) On Tuesday, just join us right here over on Spreecast. 2. I read through Donald Miler's A Million Miles in a Thousand Years: How I Learned to Live a Better Story in about two days. As in I read through naptimes and until midnight. I saw him speak at WDS and I kind of swooned. (Not really kidding.) His blend of honesty + storytelling + self-deprecating humor had me actually looking to see if he was wearing a ring. (He's engaged. And I'm, you know, married.) As a dear friend said to me, "As if a ring is the biggest obstacle between you." Ha! That still makes me laugh out loud. But seriously, I was deeply moved by his talk and by this book. I hope you will read it because I'd actually love to chat with a few people about the concepts in it - identifying what makes a good story and then deciding to live a better story. I could go on and on. Find out more about him here. 3. And here is something kind of awesome: Earlier this week, I mentioned that maybe I could paint as my practice during the Chickadee Road :: Studio Sessions this August and a few days later, here I am joining in with Pixie Campbell's Visual Quest class. I can't wait! 5. And since I seem to be in a confessional sort of mood as I write this in the middle of the night (see #2), I might as well share that I'm slowly but surely becoming obsessed with unicorns. Never was much of a unicorn, rainbows, my little pony kind of girl. Was more into pretending pretty much all the time that I was Laura Ingalls and lived on the prairie. Anyway, I'm kind of blaming this new love for unicorns on Kelly. And this. So Wednesday evening, we might have found ourselves in Barnes and Noble buying a couple of these (and by a couple I mean two that had totally different box designs but then when I got in the car and realized that the unicorn inside was a "surprise" and not the one shown on the front of the box, my husband might have had to go back inside Barnes and Noble to buy a few more...for me...while my three year old and I waited in the car...said three year old in the backseat content with her new BOOK...me needing just "the right" small plastic unicorn figurine). Anyway, an idea for a fun project appeared in the wind, so watch for these little guys to appear here and there (probably mostly here). And they are available at Barnes and Noble stores (near the board games section), but not in their online store. And doing this middle of the night post might have led me to seeing that they are a bit like Beanie Babies circa 1996 where the "hard to find ones" are "worth" a lot and all I can say is let that one go right now honey and just buy the "blind" box for $6 something at Barnes and Noble and love what you get. Or just get this because dude she is CUTE! Have a beautiful weekend over in your corner. I'm writing a post about envy that I hope to share over the weekend or Monday...because WOW what a topic that is.